by Robert Feather, MIM, CEng. Robert Feather is a metallurgist, engineer, journalist, and scholar of world religions. He is the founding editor of The Metallurgist, editor of Weighing and Measuring, and the author of The Mystery of the Copper Scroll of Qumran: The Essene Record of the Treasure of Akhenaten and The Secret Initiation of Jesus at Qumran: The Essene Mysteries of John the Baptist. He lives in London. Here, in an incredibly dry and sun bleached area there is, strangely enough, no need for zinc oxide protective blocker, or life guards. Lying some 1200 feet below sea level at the lowest point on earth, the damaging rays of the sun are screened out by the extra layer of atmosphere, and the concentration of salts in the Dead Sea is so high that anyone falling in immediately pops to the surface and cannot sink. They turned out to contain biblical texts, written in ancient Hebrew, Aramaic, and Greek from virtually every book of the Old Testament, and as such, predated any previously found Hebrew material by over 1,000 years. For the first time scholars and theologians had the astounding opportunity to look at parts of the Bible in its original language, rather than from handed down versions copied, and re-copied, and altered over the intervening millennium. In essence these biblical texts, which comprise part of what are known as the Dead Sea Scrolls, showed most of the Old Testament in its authentic ancient form - but there were significant differences. These variations are now being incorporated into modern translations of the Bible. There are also commentaries amongst the scrolls which help explain and enhance, not only parts of the Old Testament but also the New Testament. Generally understood to be part of the Essene movement of the Second Temple period, the community at Qumran had a strong hierarchical structure with the ‘right teacher’ as its leader. He was backed by priests aided by Levites, who dictated the doctrine of the group. At any one time there were about 200 members living near Qumran and all members could vote in an assembly on other non doctrinal matters, whilst general day-to-day administration was in the hands of a triumvirate of three priests and 12 helpers. Everyone had a ‘pecking order’ in relation to their level of learning and holiness, as determined by their peers. The Qumran Essenes considered themselves ‘Sons of Light’ destined to fight the ‘Sons of Darkness’ - those who did not believe in their ultra-strict code of Judaism. They thought of themselves as the keepers of the original Covenant of Moses and as part of a direct line of priests that attended the Tabernacle during the Exodus from Egypt. For them the Second Temple, reconstructed by Herod the Great, who ruled Judaea on behalf of the Roman conquerors, from 37 to 4 BCE, was a corrupt place they would not visit. One of the most startling of their beliefs related to the calendar, which for them had to be solar based, giving a year containing 364 days. The intriguing thing about this practice is the Essene calendar differs from the Rabbinic Jewish calendar, which was based, and still is based, on lunar movement giving a year of 354 days. The Copper Scroll was in an highly oxidized condition, and had broken into two separate rolled up sections. In its original state it measured 0.3 m in width, 2.4 m in length, and was about 1 mm thick. No one knew quite how to open it up without damaging the text. One lunatic suggestion was to try to reduce the copper oxides with hydrogen, or even electrolysis, to recover the copper! After considerable preparatory research, John Allegro of Oxford University, a member of the original international translation team working on the Dead Sea Scrolls in Jerusalem, persuaded the École Biblique team to let him take one of the copper pieces to England. There the first piece of scroll was finally ‘opened’ by Professor H. Wright Baker at Manchester College of Science and Technology (now UMIST) in 1955, followed by the second piece in 1956. It was written in an early form of Hebrew - a square form script - and has been shown to have linguistic affinities to pre-Mishnaic Hebrew and Aramaic, with some terms only comprehensible through study of Arabic and Akkadian. Other Dead Sea Scrolls were written in square form Aramaic script, or the so-called ‘Paleo-Hebrew’ script, derived from ‘Proto-Canaanite’ - itself an evolution from ‘Ugarit’, Egyptian hieroglyphs and ‘Phoenician’. The language was a major puzzles for scholars. The Hebrew palaeography (style of script) and orthography (spelling) in the Copper Scroll is quite unlike anything found in other texts of the time, from Qumran or from elsewhere. It has, nevertheless, been almost unanimously classified as one of the Dead Sea Scrolls, and now resides in the Archaeological Museum of Amman, in Jordan. John Allegro, a religious renegade, amongst a team of predominantly Catholic members, must have been the first person to translate the ancient Hebrew of the Copper Scroll into English. What he read, started a controversy that has raged for over 50 years amongst scholars. It contained a list of some 64 locations where fabulous treasures had been hidden, over a wide geographical area, including large quantities of gold, silver, jewellery, precious perfumes, ritual clothing, and other scrolls. The Jerusalem team refused to let him publish his findings, nervous that treasure hunters would come swarming down to disturb their work at the Qumran site. They had also already made up their minds the Qumran Essenes were essentially uninterested in worldly goods and shared their possessions amongst themselves. This mind set attitude runs throughout the academic and theological community studying the Dead Sea Scrolls, and as we shall see later on, they have preconceived ideas on what many of the scrolls ought to say and dare not entertain new ideas that conflict with long established dictums. New Dawn’s approach of trying to free up these types of entrenched views is highly pertinent to this particular field of study. The mixture of frustration and excitement soon became too much for Allegro as he began to realize there were other more sinister reasons for the strictures being put on him. He relieved his excitement about the prospect of rolling in treasure by mounting two archaeological expeditions to Jordan, in December 1959 and again in March 1960. Like many who get lost in the desert, he wandered around in a circle eventually coming back to where he started from, having found absolutely nothing. Scholars, notably Father P’ere de Vaux, Head of the École Biblique et Archéologique Française de Jerusalem, and Father Joseph Milik, members of the original Dead Sea Scrolls translation team, denounced Allegro’s translation as defective and even cast doubts on the authenticity of the Copper Scroll’s contents, assigning them to folklore. Others were not so sure, and today the generally accepted view is the Copper Scroll contains a genuine list of real treasures. The Jerusalem team’s translation came out in 1962, entitled ‘Les “Petites Grottes” de Qumran,' in the Discoveries in the Judaean Desert series. Although it is the ‘official’ version there is no accepted ‘definitive’ translation of the Copper Scroll to date, and all of the numerous editions published have many significant variants. But from some of the recognizable place names mentioned, the treasures are generally assumed to have been hidden within Judaea or near to Mount Gerizim, in Samaria (parts of modern Israel) and to relate to treasures of the Second, or possibly First Temple of Jerusalem. Both temples were known to be places where considerable wealth was accumulated through the donation of sacrificial gifts and ‘tithes’ by the general community. There are over-riding problems with all of the current theories which, until now, have not been resolved. Scholars have puzzled over how so much gold could have come from the First or Second Temples of Jerusalem, let alone come into the ownership of an ascetic, relatively impoverished sect like the Qumran Essenes. More significant is the fact none of the conventional theories have led to the discovery of any of the treasures listed in the Copper Scroll. My own view is rather different. Whilst part of the treasures may well have come from the First or Second Temples at Jerusalem, as descriptions in the Copper Scroll certainly refer to Temple associated objects, when the secrets of the Copper Scroll are unravelled it becomes patently clear that another Temple is involved in the descriptions - and the Qumran Essenes were guardians, not just of treasure. The presence of Greek letters interspersed at the end of sections of the text aroused my curiosity, as their meaning was not understood and they appeared to be some kind of cryptic code. Many theories have been put forward to try to explain these apparently random Greek letters. They are variously considered to be made by scribes as reference marks of some sort, initials of place names, entry dates, or location directions, but none of these explanations is accepted as conclusive and they remain a puzzle. The numbering units given in the text, which relate to the amounts of treasure, are also not clearly understood by modern translators. The numerals are in an unsophisticated long-hand form involving apparently unnecessary duplication. There were other ‘anomalies’ for which there appeared to be no satisfactory answers. No other Dead Sea Scroll was engraved on copper, nor any known Hebrew texts from anywhere else, prior to the period. Why should a non materialistic community go to such trouble to preserve the information on the Copper Scroll? Where did they get the extremely pure copper (99%) from? How could they afford its very high cost? When I looked closely at the numbering units and weights used in the scroll, it soon became clear they were not of Canaanite or Judaean origin, where the Qumran Essenes resided, but Egyptian! Indeed, the numbering system in the Copper Scroll is typical of that in use in Egypt around 1300 BCE. The Egyptian system used repetitive single vertical strokes, up to the number 9, combined with repetitive decimal units for larger numbers. If the numbering system was Egyptian, why not the weight terms also? The ancient Egyptians had developed a system of weights specifically designed for weighing precious metals, and this system was based on the ‘Kite’, a unit weighing approximately 10g, but sometimes used as a double unit (KK) of 20.4g. I believe it is no coincidence the ‘hard ch’ sound of the weight term used in the Copper Scroll text equates to the Egyptian ‘K’ in ‘Kite’! When these ancient Egyptian weight units are applied, typical of the period prior to 1000 BCE, to calculate the quantities of gold, silver and jewellery mentioned in the Scroll, rather more realistic weights are obtained than those given earlier. Yet, all the major characters of the Bible, from Abraham and Sarah, to Jesus and Mary, had strong links to Egypt. Joseph, Jacob, all the founders of the 12 tribes of Israel, as well as Moses, Aaron and Miriam, Joshua, Jeremiah and Baruch, all lived for long periods in Egypt and were influenced by its culture and religions. After a lengthy analysis I came to the conclusion that Joseph had interacted with a pharaoh by the name of Akhenaten - a monotheistic pharaoh - and many of the basic tenets of Judaism, and by extension Christianity and Islam, came out of Egypt. The river that branches from the Nile at Amarna (ancient Akhetaten), Pharaoh Akhenaten’s capital city, is to this day know as ‘Bahr Yusuf’, ‘Joseph’s River’, and there are many other clues. When I started comparing descriptions of the treasure locations given in the Copper Scroll with sites at Amarna, it soon became apparent there were many close parallels. Not only that, some of the locations have already yielded archaeological finds of treasures that match very closely the descriptions and weights given in the Copper Scroll. Many of these treasures can be seen in Museums in Britain and Egypt. Having made a connection for the Copper Scroll to Akhenaten’s Holy city in middle Egypt, it was not surprising a most powerful piece of evidence emerged when I looked again at the strange Greek letters scattered in the Scroll. When the first 10 are put together they spell out the name Akhenaten! Since publication of the first edition of my book, The Copper Scroll Decoded, in 1999, the main theory has been tested against a broad spectrum of academic and scholarly opinion, and in many instances response to the main thrust of the theory has been favorable and enthusiastic. Where there has been a negative response, it has been in the form of guarded skepticism, particularly as the theory presents a radically new view of religious evolution which strongly conflicts with enshrined orthodoxy. Response from academics, on specific areas of their own expertise, has generally been supportive. On alternative interpretations of the meaning of the Copper Scroll, for example, particularly in the context of the weight and number terms given in the Scroll, there has been a considerable consensus of acknowledgement that previous interpretations have not been correct. Amongst those scholars conceding previous translations are deficient, one of the world’s experts on the Copper Scroll, Judah Lefkovits, of New York, has reiterated the Scroll is much more problematic than some scholars would allow. He has written a number of books on the subject, including a recent classic work The Copper Scroll 3Q15: A Reevaluation; A New Reading, Translation, and Commentary, and now does not think the conventional translation of the weight term as a Biblical talent is necessarily correct. He has suggested it might be a much smaller weight, such as the Persian karsch. In supporting my claim, against the views of previous researchers, he now believes the total precious metal weights have been greatly exaggerated. One eminent scholar, Professor Harold Ellens, of the University of Michigan, has come out strongly in favour of the generalized theory, which he says is almost certainly basically correct. He perceives many of the sectarian Dead Sea Scrolls of the Qumran Essenes, such as the Temple Scroll, New Jerusalem Scroll, the Aramaic Testament of Levi, Qahat, and Amran, Jubilees, and the Cairo-Damascus documents, as derivative of Ezekiel’s thinking in refusing to recognize the legitimacy of the Second Temple and standing outside normative Judaistic authority. In a sense he recognizes two quite separate sets of biblical texts - Ezekielian and non-Ezekielian. One of the most interesting aspects of this theory relates to Ezekiel descriptions of a Temple, which is generally taken to be a visionary Temple that would one day be built in Jerusalem. However, when you compare the descriptions Ezekiel gives in the Old Testament to those of the archaeological reconstructions of the Great Temple that stood in Akhenaten’s Holy City, it is quite clear he was talking about that actual Temple and not one which would one day stand in Jerusalem. Recently Michael Chyutin, and Shlomo Margalit, Israeli architects, have conducted independent studies on the Scroll and come to the conclusion it is almost certainly describing Akhenaten’s city at modern day Amarna. Without the explanation I have put forward, for a link from Amarna down to the possessors and authors of the New Jerusalem Scroll, conventional history has no answer to the problem. Incidentally these studies show that two other Egyptian cities also exhibited similar characteristics to those described in the New Jerusalem Scroll - namely Sesebi, a city located between the second and third cataract of the Nile, and the Hebrew settlement on the Island of Elephantine, near Aswan in southern Egypt. A connection to Sesebi is not so surprising as it was, like Akhetaten, built by Akhenaten. Why the strange pseudo-Hebrew settlement on Elephantine Island, which is dated to at least the 7th century BCE, should show similarities is more intriguing. The people there worshipped Yahwe, the Israelite name for God, and built a temple as a place of worship. The explanation of how this isolated community came into existence has never been satisfactorily resolved. My own theory is they were a residual enclave that formed after the destruction of Akhenaten’s Holy City when survivors, mainly the earliest monotheistic Hebrews, fled south for safety. An Australian scholar, E. Maclaurin, of the University of Sydney, adds weight to my theory in a paper entitled 'Date of the Foundation of the Jewish Colony at Elephantine', published in The Journal of Near Eastern Studies, Volume 27, 1968. Another Australian scholar, Ian Wilson, seems to date the Exodus to around 1500 BCE, but the general consensus is it took place some time in the 13th century BCE. These are not the only students of Dead Sea Scroll study with an Australian connection. I, too, have a warm affection for the country, having spent seven years of my early life in Sydney, where my mother was born! Another scroll, the Temple Scroll, spells out the dimensions of the longest Temple wall as 1600 cubits, equivalent to 800 m. Conventional scholarship has nowhere to go in Jerusalem to accommodate the Qumran Essenes’ concept of this building. The Temple Mount in Jerusalem measure only 550 m x 185 m. So they conclude it must be the description of a fictitious temple. The length of the longest wall of the Great Temple at Amarna has been measured, from detailed archaeological excavations, as being 800 m.
When the Qumran Essenes built their main settlement building at Qumran in ‘exact’ alignment to the main walls of Akhenaten’s Temple, and constructed 10 ritual washing pools, they were echoing a recorded memory of that Temple. Uniquely, and unknown from anywhere else in Israel, one of the ritual washing ‘Mikvaot’ has four divisions - just as one of the ritual washing basins in the Temple at Akhetaten exhibited. That the name of Aten or Aton, the name by which Akhenaten knew his God, is embedded throughout the Old Testament, has many attesters, from Sigmund Freud onwards. Many Egyptian names are read with the letter ‘D’ or the letter ‘T’ - Touchratta or Douchratta, Taphne or Daphne, and in Egyptian Coptic the letter D can be pronounced ‘D’ or ‘T’ . Thus, Aton could well be written ‘Adon -ai’ where ‘ai ’ relates God to the Hebrews in the sense of ‘my master’. 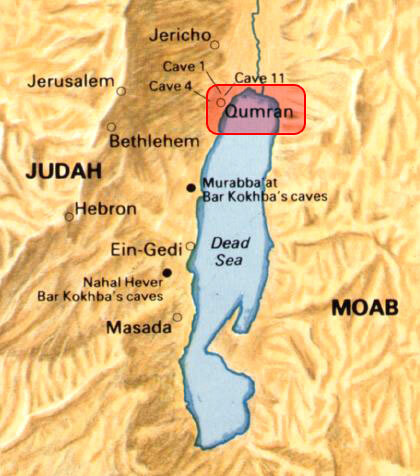 Earlier in this article the question was posed as to why Qumran was so important to historical and biblical history. Part of the explanation has now been outlined in this article, and is described in more detail in my latest book The Mystery of the Copper Scroll of Qumran, published in June 2003. However, as yet there is no complete answer to the question as the modern story of Qumran is still being written. There are more secrets to be revealed and I hope to do that in a sequel book now in preparation.